Peggy Adams Animal Rescue League. Sponsored by Pet Supermarket and Century Risk Advisors. Helping pets is a noble vocation. It takes a warm heart and a clear head to manage the logistics that saves animals in crisis and find forever homes. $10 Donation Suggested at the Door. 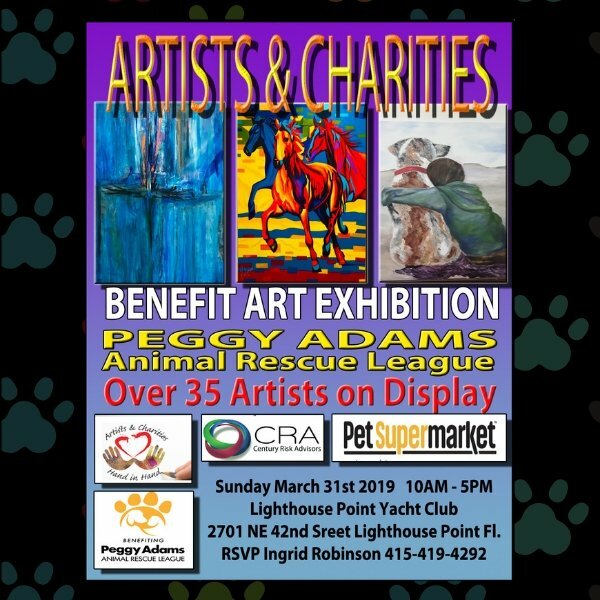 An art show to benefit the Peggy Adams Animal Rescue League is coming to the Lighthouse Point Yacht Club. Ingrid Robinson, an internationally-known branding powerhouse, brings together over 35 local, award-winning artists and sculptors to support the many needs of Peggy Adams Animal Rescue League, caring for pets needing forever homes. twenty per-cent (20%) of all art sales will be donated by the artists. More than thirty-five independent artists and sculptors (award-winning and some internationally known) will be exhibiting. Media includes: Acrylic, Oil, Water Color, Photography, Pencil, Sculpture, 3D, Charcoal, and Mixed Media. The Mission of the Peggy Adams Animal Rescue League is to provide shelter to lost, homeless and unwanted animals, to provide spay and neuter and other medical services for companion animals, and to care for, protect, and find quality homes for homeless and neglected companion animals, to advocate animal welfare, community involvement and education to further the bond between people and animals. Pet Supermarket’s mission is to offer the highest quality products at a great value to improve the quality of life for all pets and pet owners. Pet Supermarket works with area organizations to host adoptions and related events for cats and dogs. innovative, value-driven insurance and risk management solutions to businesses and individuals.